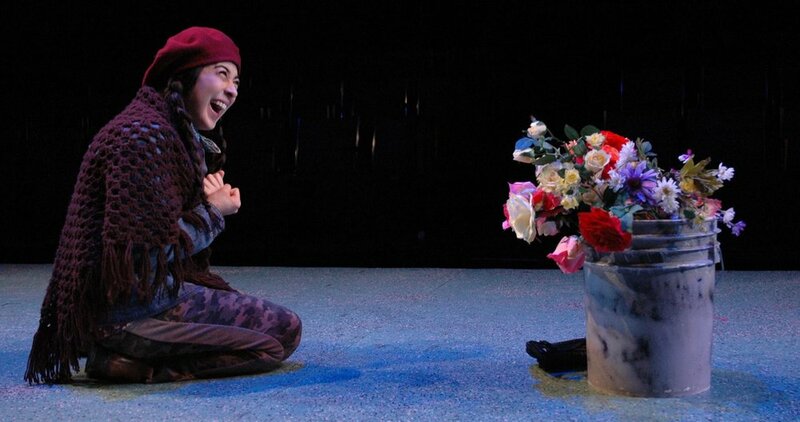 “Hurray for Leigha Kato, this production's Eliza; she's terrific. […] Kato handles the difficult vocals well and makes her own Eliza, a fighter from the start who wins over the audience instantly. The changes in Eliza emerge through a series of costumes, and Kato seems to inhabit each stage, taking on change (correct pronunciation, expanded dreams) while retaining her sense of self (determination, awareness, willing to proceed but nobody's puppet). “Leigha Kato's Eliza Doolittle, first encountered as a rough-talking ragamuffin selling flowers, grows in ways overlooked by most productions. […] Kato's Eliza is the first I've seen in My Fair Lady who re-defines her terms instead of meekly submitting to Higgins; she's also the first in my experience resembling Shaw's Eliza, whom the playwright deliberately did not romantically entangle with Higgins. Kato played the title role in Shaw's Saint Joan at Quintessence, and retains her defiance and intelligence. "Leigha Kato shines as Courage's mute daughter Kattrin. Although she never speaks a word, Kato is responsible for the most excruciatingly intense sequence of the play." "Kattrin, the dumb daughter, suffers greatly in the story, and Leigha Kato’s exquisite expressiveness shouts it out loud." "Kato's Joan inspires, her simple eagerness convinces, her confidence and hope elevate all who watch her performance. I would call it a tour de force from this young woman (whom I've seen twice on stage now), but it is beyond compare, a singularity of passion and energy, like Joan herself in history, and her dissident role remains just as relevant today as ever." "I doubt that anyone ever topped the performance of Leigha Kato [...] Her Joan is a bracing presence. With ebullience and vision." "Leigha Kato gives a powerhouse performance as Saint Joan. There is an intensity in Kato's Joan that is instantly compelling and thoroughly convincing. When Kato celebrates Captain de Baudricourt's capitulation the sense of joy she exudes is palpable and when she weeps for her freedom her despair is profound." "Leigha Kato, ingenuous, passionate, girlish, enthusiastic, and confidently committed to the saintly voices she hears as George Bernard Shaw’s Joan of Arc, remains the centerpiece of Rebecca Wright’s production of “Saint Joan” even when she’s offstage. Kato’s Joan energizes Wright’s staging. Her overriding presence, and the affection she engenders, give particularly deep context to Shaw’s play about vanities and jealousies among jurisdictions, hunger for power, the poison of politics in everything, and role of wealth in gaining political sway. Kato’s is simply a marvelous interpretation and ebullient exhibition of all Shaw’s Joan of Arc is and can be." "Leigha Kato and Lindsay Smiling’s incestuous dance as Myrrah and Cinyras left audience members open-mouthed, spellbound." "Leigha Kato’s portrayal of Myrrha, a daughter who is cursed to fall in sexual lust with her own father, played with amazing physicality." "Leigha Kato had arguably the best vocals of the night." "Leigha Kato, whose strong and true take as Little Red Riding Hood becomes gorgeously lyrical when she dons the golden braids that turn her to Rapunzel."